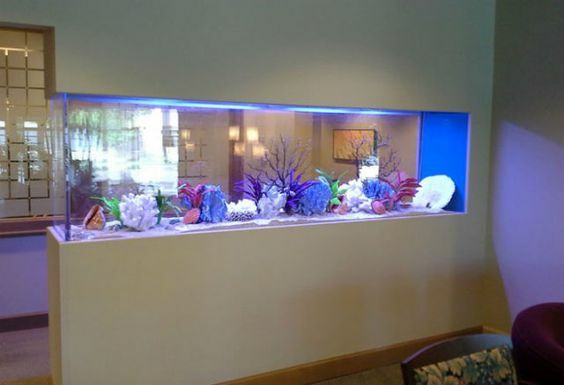 Seaquaria can Design your dream aquarium for your home, office, or place of business. Allow us to handle the heavy lifting, Installation & Maintenance will be handled by us. No need to get your hands dirty! Sit back and enjoy your fish, coral, aqua-scape or plants! 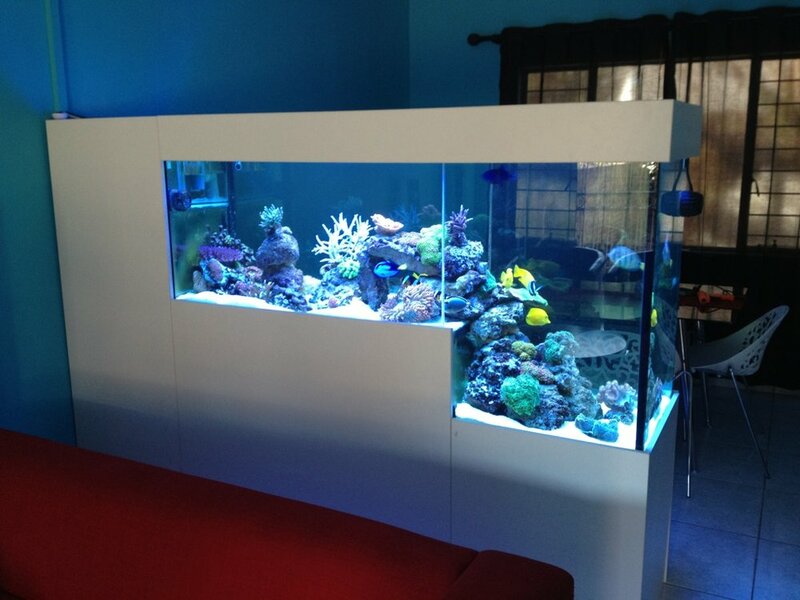 Project Liquidator is a clients aquarium consisting of the Seaquaria Aquarium Package #3 with Ecotech Radion XR30w Lighting and Neptune Systems Apex 2016 Controller! Here's the latest update on the coral residing in Project Starfire. See Aquarium Package #1 for hardware list. Project Cubal (Coral Cube) is a 64 gallon 25x24x24 Cube Saltwater Reef Aquarium. Investment in this project is minimal, since most of the parts are used or borrowed. This Project is a showpiece for my basement where I spend a lot of time. Project FOWLR also resides in this room! Feeding time in Project Cubal! Project FOWLR (Fish Only With Live Rock) is a 125 Gallon featuring semi-aggressive livestock. Livestock include Huma Huma Trigger, Niger Trigger, Maroon Clownfish Pair, Yellow Tang Pair, Velvet Damsel, Fiji Devil Damsel Pair, Hippo Tang, Diamond Watchman Goby, Coral Banded Shrimp, Cleaner Shrimp Pair, Camelback Shrimp Pair. Green Star Polyp and Pulsing Xenia will be grown on Live Rock over time. *These designs are conceptual, and not necessarily the work of Seaquaria Design. Click on Seaq-Wear (IA) to donate and to receive a reward! Please complete the form below for further inquiries. Seaquaria uses the best available products! From Apex Aquarium Control Systems to Radion Premium Lighting, we offer the best and most reliable options for our clients. The installation of your aquarium will be handled professionally, carefully and courteously, as if it were our own. Your new aquarium will be delivered directly to your home or office from our supplier. Staging and Installation will be coordinated and scheduled based on the timeline of the delivery and your availabilty. 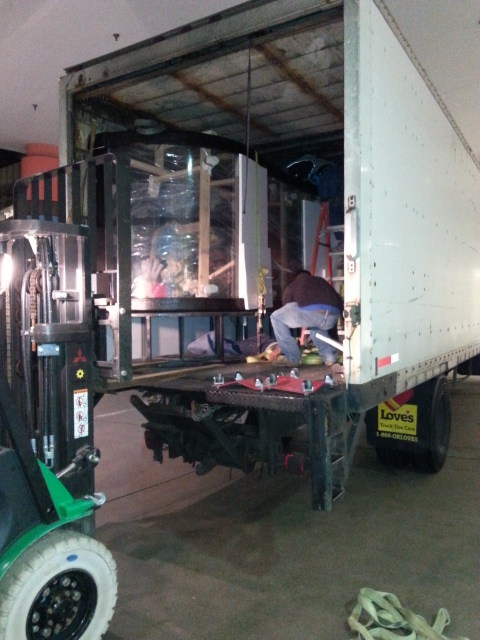 The aquarium will be moved from the delivery area to your desired installation area. Once staged, any necessary tweaks will be made before installation occurs. Our team carefully installs the aquarium according to plans and specifications. Once installed, water, sand/substrate, and aqua-scaping are all carefully added. Seaquaria serves the Washington DC metropolitan areas, including parts of Maryland and Northern Virginia (DMV). We are happy to design, install, and maintain your aquarium! We maintain all types of aquaria, including coral reef tanks, marine fish tanks, and freshwater tanks. Seaquaria will design any aquarium to suit your setting and fit your budget.